To Cite: Karanjam S S, Karanjam S, Zarif Sanaiey N. Designing a Comprehensive Organizational E-Learning Model Using the Meta-Synthesis Method, Interdiscip J Virtual Learn Med Sci. 2017 ; 8(3):e11496. doi: 10.5812/ijvlms.11496. Background: Management knowledge in the new centuryis, which is more important than anything when it comes to continuous change and development. Any organization that is not adapted with these waves is unsuccessful. The present study tries using the meta-synthesis method to design a comprehensive organizational e-learning model. Methods: This study is a qualitative study, its method is heuristic, in terms of time it is sectional and in terms of purpose it is developmental and applied. This research method is a kind of meta-synthesis method that in order to implement the method, the 7 stage model of Sandelowski and Barroso (2007) was used. In this study, after designing research questions, a systematic search of databases of Persian and English papers, based on keywords related to organizational e-learning and all related and available papers, were collected and reviewed from 1992 to the end of 2015. In other words, to design the research model, no sampling was done; also in order to assess the content validity of the model, professors and experts’ opinions, in the field of e-learning, were used and to assess its reliability, Kappa indicator was used. Results: After performing 7 stages of the meta-synthesis method and reviewing 324 articles in asystematic way, a model was designed with 12 groups (intellectual capital management, e-learning practices, learning facilitating factors, technical infrastructure, educational infrastructure, the people involved, individual factors, information, technical features, training, strategic management, and communication), 49 concepts, and 531 codes. Conclusions: According to the desired reliability and validity of the model designed based on professors and experts’ opinions, this model is recommended to recognize and plan e-learning system in organizations. After the transition from the industrial age and living in the information age, this age-related technology (including information and communication sciences) also has a special position and became one of the strategically vital factors in improving the life of individuals and institutions. Increasing the sciences, in turn, has caused rapid changes in all societies (1) that the increasing developments affect all organizations (both large and small) and change the working environments continuously and extensively. Hence, organizations for more speed in activities, effectiveness, and flexibility are re-designed (2) and to secure their survival welcome changes. Successful managers are those who always follow these developments and prepare their organizations to meet the challenges of tomorrow (3). For realization of this, employees are at the center of attention (2). Human resources are the most important element of any organization to gain competitive advantages in a dynamic and challenging environment of todays business Human resources are considered as one of the main strategies to achieve the goals of organizations. Therefore, improving the productivity level of human resources can be considered as one of the main goals of any organization and/ or institution, thus providing an an accurate and proper planning. One of the factors effective on the productivity of human resources is training (4). Learning is a relatively permanent change in a behavior or a potential behavior that is the result of a direct or indirect experience (3). In other words, learning is a process in which individual’s intellectual behaviors and models are changed, which allows them to think and act in another manner. In other words, scientists list several reasons for the importance of learning, including: 1.human curiosity, 2. the use of knowledge and awareness to succeed in personal, organizational and social life, 3. thought health, and 4. adapted behavior including changed personality, and change and progress (5). Personnel and members of an organization should constantly learn new content and skills to adapt themselves with these changes and innovations (6). Therefore, updating information knowledge, as well as skills and abilities of personnel seems to be vital and a necessary task. This can be realized in the shadows of identifing personnel needs and to formulate a proper and systematic program (6). Regarding the expansion of technology, the Internet reveals the need to use new and active learning methods in the proper formulation of such methods (7). E-learning, which is is presented as the most advanced training method in the world today (8), can meet this need. Since the 1960s, various definitions have been made for e-learning and in various commercial, educational, and military departments different meanings have been used. In a general definition, e-learning is the use of network technology (e.g. the Internet) in order to design, present, and implement an educational environment to achieve and sustain learning. Furthermore, Ramiszowski, in his comprehensive definition of e-learning, considered this concept as consisting of 4 aspects; he stated that e-learning can be both an individual and group activity, as well as both continuous (communicate with learning resources or individuals simultaneously) and discrete (non-simultaneous communicate i.e. using prepared CDs and/ or through educational materials downloaded previously from the internet) (9). E-learning, or more simply knowledge transfer using information technology grounds (10), in addition to changing the teaching-learning process and knowledge management, plays an essential role in the development, deepen, and sustain the culture of information and communication technology. This method is using the advances in industry and information and communication technology is considered as a modern solution of educational justice in the contemporary world. Furthermore, according to information and communication technology experts’, declaration by 2020 e-learning will be the conventional method of education in the world (11). Nowadays, e-learning is not only in educational organizations and universities, but also in military, industrial, commercial and administrative environments as well as many other places. It has attracted a lot of attention thus making e-learning one of the most important tools to solve problems. It has attracted the attention 21st century firms as well as managers in leading their organization. Furthermore, in the competition field, education of their personnel should be done in a manner that distinguishes them from other organizations’ personnel. In Iran, with the introduction of design (functional development of information and communication technology) and more attention to the use of information technology, e-learning has been considered by organizations. Of course, it should be noted that now there is no e-learning system in a comprehensive form in Iranian organizations in charge of education of their managers, personnel, and customers. Each of the organizations to assess the readiness, formulation, and implementation of e-learning require a comprehensive model that its aspects and components are the guide of managers, strategists, and other personnel to run this important (12). 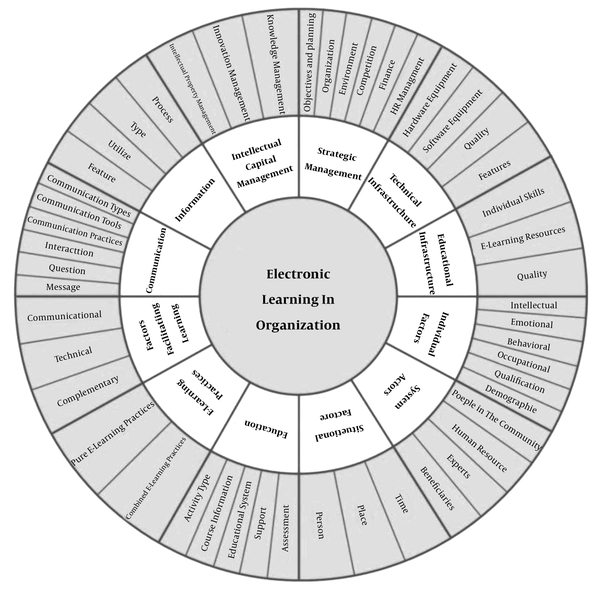 The present study attempts using the meta-synthesis method to design a comprehensive model of e-learningmodel in organizational space. This study is a qualitative study, in terms of method it is heuristic, in terms of time is it sectonal and in terms of the purpose it is developmental. Nowadays combined studies and qualitative analysis has increasingly attracted many researchers’ atention that provide the extract of studies done on a specific subject in a systematic and scientific manner to researchers. One of the methods introduced in the past few years aimed to examine and combine studies’ pathologyis is meta-synthesis (13-15). In order to achieve the purpose of this paper, the 7-stage meta-synthesis method of Sandelowski and Barroso (16) has been used. Its stages are summarized in Figure 1, and then detailed stages of the implementation of meta-synthesis method are provided. It should be noted that the study population consisted of all studies related to the study subject; in other words, in order to design the research model, no sampling was done. In order to assess the content validity of this model, professors and experts’ opinions in the field of e-learning and organizational development were used and to assess its reliability Kappa, indicator was used that was based on the Sandelowski and Barroso model. This should be examined at 7 stages of meta-synthesis method (quality control). A. What: First, the main purpose of the study is determined, in this research, the purpose is the identification and classification of aspects and components of e-learning in the work environment. B. Who: The second parameter is the study population and represents data databases, journals, conferences, and used search engines. The population of the study consisted of all achievable studies in the field of e-learning in working environments obtained from databases of: Emerald, Taylor and Francis, Wiley Springer, (SID) Scientific Information Data Base, Science Direct, Google Scholar. C. When: This introduces time framework of the study run. Studies in this research are all available, studies related to the study subject was conducted between 1992 and 2015. D. How: The last parameter indicates the method that has been used to provide the studies. In this study, cross-citation analysis and secondary data analysis, has been documented. The researcher, with regards to the criteria [mentioned in the next stages], identified and determines available and related papers to the study subject to enter the process of meta- synthesis and unrelated papers to exit the process. 2. 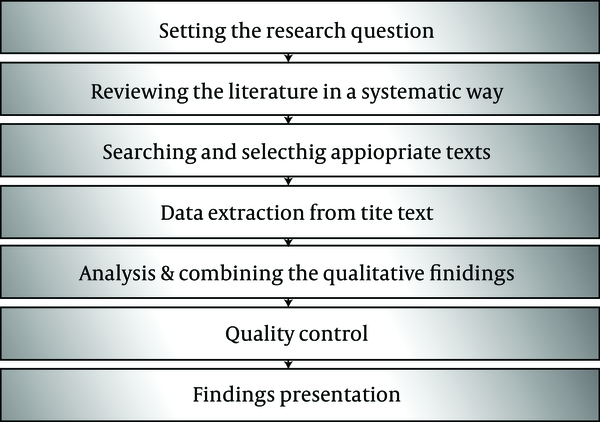 Systematic literature review: The second stage is the systematic review of the literature, at this stage the researcher focuses his systematic search on published papers in various journals and selects keywords to search papers (14, 15). In this study, databases, and a variety of search engines, were studied between 1992 and 2015 and various words to search papers were considered. The main phrase to search these papers was “distance learning in business environments”, “organizational e-learning systems”, “learning in e-HR”, and “organizational e-knowledge management”. 3. 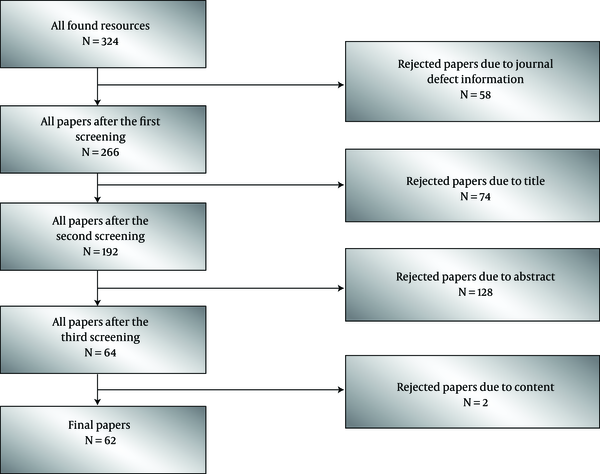 Search and selection of appropriate papers: After extensive research, the papers found during several stages are reviewed and excluded until appropriate papers are identified and seperated from other studies collected, in other words all collected studies are excluded from the study that, from the perspective of the author or journal, are incomplete and/ or one of the sections of title, abstract or study is not according to the study subject or research questions. In this study, after an extensive search, a total of 324 papers were obtained in this field between 1992 and 2015, the first study was performed to separate them. Figure 2 shows how to choose appropriate papers and the results. It should be noted that for measuring the quality of selected literature, at this stage the program, critical appraisal skill program (CASP) is used. CASP consists of 10 questions that helps the researcher to determine the accuracy, validity, and importance of the studies. The questions focus on: 1. research objectives, 2. the method logic, 3. research design, 4. sampling method, 5. data collection, 6. reflectivity (the researcher relationship with participants), 7. moral considerations, 8. data analysis, 9. clear expression of the results, and 10. research significance. At this stage, the researcher, after scoring each question quantitatively, a form is created, papers’ score is summed, and therefore can assess papers socially. Finally, the researcher based on a 50-option Rubik scale (Table 1) scores and excludes papers with a score below the good score (14, 15, 17). 4. Extract information on the literature: At this stage, the researcher reviews various and final papers continuously (in order to achieve the content results). Then, researchers classify, summarize, and encode obtained information from the references on the basis of criteria such as: the authors name, year of publication, the study purpose, and the method and classification of being analyzed (17). Therefore, at this stage of the study, the remaining 62 papers’ information of the process should be collected in 1 or more. In this study, these are presented in Tables 2 and (in supplementary file). Table 2 shows the names of the authors of all final papers after the 4-stage review process of the study. In this information information of each paper (name of author, year of publication) has a number to avoid full expression of these in the next Extracted Extracted codes from each paper are shown in Table 3. Column 1 is related to the raw, the column 2 is related to the code and the 3 is related to each paper number. As it is observed, first all criteria available in final papers are collected and each criterion has been taken into account as a code, then the frequency of each of papers’ codes has been studied; in addition, the criteria, that in every respect have the slightest difference from each other, also have different codes. For example, in the codes codes 2, 284, 441, 111, 112, 189, and 188, respectively, are “assessment”, “test”, “testing”, “personnel test”, “professors’ test”, “mid-term exam”, and “final exam”, which some cases overlap and some reflect one meaning. However, due to apparent differences, each is shown independently in the As As seen in extracted criteria from 62 papers have been used in this model. 5. Analyzing and combining qualitative results: During the analysis, the researcher searches subjects or themes that have been apparent among studies included in the meta-synthesis; this represents a study by the researcher to recognition or studied subjects. The researcher in this section after identifying subjects, classifies them and puts similar and related categories in a subject that best describe it. The final themes are the basis of the formation of “explanations, models, theories or hypothetical” (14, 15). In the present study, first a code has been assigned to all factors derived from studies then by considering the concept of each of them, codes were classified in the form of a similar concept. In this way, the study concepts (themes) are formed. 6. Quality control and assessment: Maintaining quality control includes: 1. In the study, the research ertries to take determined steps by providing clear and rejecter explanations and for available options in the study; 2. Researchers use both electronic and manual search strategies to find related papers; 3. At the right time, the researcheruses established, determined and systematic programs to select and assess the quality of studies; 4. At the right time, the researcher uses established approaches and attitudes to integrate the main studies in qualitative research and 5. The researcher uses the methods of quality control of the main qualitative research studies (18). Accordingly, in the present study, to assess the quality of the selected studies CASP method has been used. As mentioned before, in order to examine the quality of the methodology of studies based on the program of critical appraisal skills, based on ten criteria mentioned for each paper an score has been considered. The results of scores of 62 papers passed through the four-stage process of the study review are shown in Table 4 (in supplementary file). In this way, of a total of 50 points considered for each of 62 papers, the lowest score has been 39, the highest score has been 49 and the average score has been 45.629. It should be noted that papers excluded due to unrelated title, abstract and content have had scores less than 30. As a result, in the assessment process of the researcher of 324 papers 262 papers have been excluded and finally 62 papers have been remained to analyze the information. It should be noted that in this study (in addition to CASP) another method has been used for assessing the quality of the content. In this paper, researchers to control their extracted concepts have compared their opinions with another expert. To achieve this, a number of selected literature was provided to a person (expert in the field of e-learning) without the knowledge of how to combine codes and concepts created by researchers to classify codes in categories seperately. Then, presented categories by researchers were compared with presented categories by the person. And finally regarding similar and different categories of the researcher and expert,Kappa indicatorhas been calculatedthat indicates the reliability of the above. The indicatorcalculation has been provided in Equation 1. As seen in Table 5, researchers have created 28 categories and another expert has created 29 categories, of which 25 categories are common. As shown below, Kappa Indicator value is equal to 0.778 that according to Table 6 the value is at the level of the valid agreement. 7. Findings presentation: At the final stage of meta-synthesis, the results of the previous stages are presented (14, 15, 19). In this study, 62 selected papers were examined by researchers during 5 months and needed information is based on the main objective of this paper i.e. identify, classify and group e-learning aspects, and components in organizational environments. Finally, at the last stage of the seven-stage meta-synthesis method, a model with 12 groups (intellectual capital management, e-learning practices, tools facilitating learning, technical infrastructure, educational infrastructure, the people involved, individual factors, information, technical features, training, strategic management, and communication), 49 concepts, and 532 codes were designed. A summary of grouped initial, final, and sub-factors (comprehensive model, (in supplementary file)) and summarized comprehensive model as schematic (Figure 3) are provided. It should be noted that the validity of the final model of the study was confirmed by 7 experts in the field of e-learning. Shaeidi and Sadeghzadh, in their article, presented some models, which are beneficial tools for evaluating existing experiences and factors that influence its effectiveness. These models opt to define suitable frameworks for challenges that learners face when using technology in education in order to provide an effective e-learning experience. The presented models (20). Kheyrandish presented an article that was carried out with the aim of investigating the assessment pattern of virtual education in the national Iranian oil products distribution company. The result of this article showed that Technical and technological, social and cultural, educational, legal and administrative, as well as strategic and components were all effective and acceptable factors for the assessment of virtual education. All of the pattern components were in acceptable condition for the implementation of virtual education, except for the strategic component (21). Faezi and Behzadi, in the article, designed a model to assess the readiness of the indigenous system of e-learning in organizations and financial institutions. This model was fitted with the help of the worksheet that contains the index of the model; in order to assess the rate of National Bank of preparation were used in total, represent the Agency’s lack of readiness for entry into this arena (12). For achieving the first main objective of the current study (identification and classification of aspects and components of e-learning in the organization), databases used in the study (Science Direct, Emerald, Taylor and Francis, Wiley Springer, SID, scientific information data base, and Google Scholar), selected papers’ time frame (1992 - 2015), the study population (the study population consisted of all related and available studies in the time frame specified; in other words, to design the study model no sampling was done), and the selection criterion of an appropriate paper and in accordance with these, the search process of papers began. Then, after this wide search, a total of 324 papers were found relevant to the research subject that respectively: 58, 74, 128, and 2 of them were excluded from the study process during 4-stage assessment of the title, abstract, content, and publication of information and 62 papers remained. After an accurate 5-month investigation, 531 codes were extracted from the papers and at the next stage of the analysis and synthesis of these codes; new concepts were created to make a research model. Then, the quality of research achievements to this point were assessed. In this way, to control the quality of screened papers, 10 criteria of critical appraisal skills program (CASP) were used and scores have been assigned to each of the selected papers based on the Rubik scale (Table 1). In this way, of a total of 50 scores was considered for each of the 62 papers, the lowest score was 39, the highest score was 49, and the average score was 45.629. It should be noted that papers excluded due to unrelated title, abstract, and content have had scores less than 30, and each of 62 selected papers had a proper quality. It should be noted that in this study (in addition to CASP) another method has been used for assessing the quality of the content. In this paper, researchers to control their extracted concepts have also compared their opinions with another expert. To achieve this, a number of selected literatures were provided to a person (expert in the field of e-learning) without the knowledge of how to combine codes and concepts created by researchers to classify codes in categories separately. Then, the person compared presented categories by researchers with presented categories. Finally regarding similar and different categories of the researcher and expert, the value of Kappa indicator was calculated .778 that this value is at the level of the valid agreement and represents the reliability confirmation of codes and concepts used in this research designed model. Also, the validity of this model was confirmed by 7 experts in the field of e-learning. Finally, at the last stage of the seven-stage meta-synthesis method, a model was designed with 12 groups, 49 concepts, and 531 codes. Groups and concepts of each of them briefly include: intellectual capital management (knowledge management, innovation management, and intellectual property management), e-learning practices (pure and combined practices of e-learning), learning facilitating factors (relational, technical, and complementary factors), technical infrastructure (software equipment, hardware equipment, the quality of technical infrastructure, technical infrastructure feature), educational infrastructure (familiarity with the system, educational e-resources, and the quality of educational infrastructure), people involved in the learning process (people in the society, human resources, experts, and beneficiaries), individual factors (intellectual, emotional, behavioral, competence, demographic, and occupational factors), information (process, types, use, and features), technical features (time, place, and people), education (type of activity, information of educational period, education, support, and assessment system), strategic management (goals and planning, environment, organization, competition, financial and human resource management), and communications (interaction, message, question, communication tools, communication practices, and type of communication). It is hoped that managers and strategists using this model in their organizations can take effective steps to recognize and plan an organizational e-learning system. References of supplementary material are available here (10, 12, 21-35, 36-50, 51-60, 61-70, 71-80). The present paper is extracted from a research study. Consultation of research method was provided by Dr. Payam Shojaee, faculty member of management department of the university of Shiraz, which thereby we appreciate him. We also appreciate professors, elites, and experts at the scientific center of E-Learning, Shiraz University of Medical Sciences for scientific support to assess the content validity of the model. Authors’ Contribution: Developing the original idea, setting the research question and findings presentation: Seyede Shima Karanjam, Nahid Zarif Sanaiey and Sara Karanjam; reviewing the literature in a systematic way, searching and selecting appropriate texts, data extraction from the text: Seyede Shima Karanjam; quality evaluation of the selected studies and systematic literature reviews: Nahid Zarif Sanayei; analysis and combining the qualitative findings, validity and relaiability control: Sara Karanjam. 33. The practice of hris applications in business organizations in jordan: An empirical study. COES&amp;RJ-CP2-5. 56. Differences in e-learning approach for three worker roles in a manufacturing environment. Proceedings of the 4th Twente Student Conference on IT.